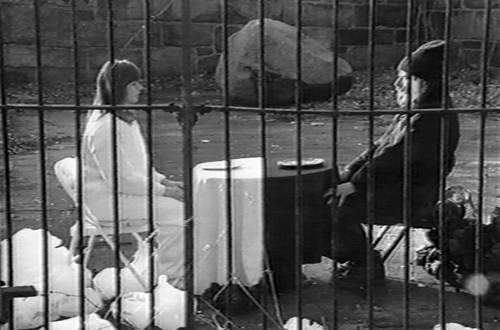 We were seated across from one another at opposite sides of a table inside of a huge abandoned zoo cage. It was sharply divided by two different colors, the same way we were dressed. We endlessly passed "meals" to each other that were designed by the principle of opposing life philosophies (sharply different colors). The "meal" would be soberly brushed aside by the each recipient. By this mutual refusal to taste the opposite meal, the circle of refusals was repeated for several hours. This cycle kept us from developing the mutual understanding that would lead to the prevention of otherwise inevitable violent conflict.